The blessings of the holiday season are keeping me in gratitude. 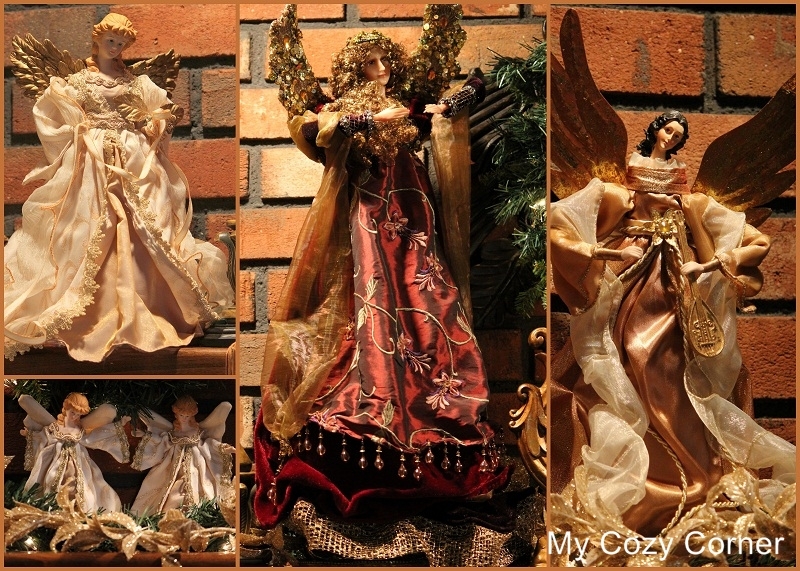 The beautiful angels are dressed to parade on the mantel this year. To see 2011 mantel dressed up Go Here. Now twenty-two years later I still enjoy opening the boxes each year and taking out the tall and not so tall angels and placing them around the living room. The tallest one is this angel with a beautiful brocade dress and sequined wings. The inspiration for this post was the musical instruments the angels are playing. I hadn't noticed until this year when I was designing this year's mantel that the angels were holding musical instruments. The harp and angels have always been symbolic during the Christmas season. Our new church has beautiful acoustics and in October we had a concert with a harpist playing the most beautiful harp music. The wreath hanging over the mantel has the traditional orchestra instruments draping from the greenery. I found the ornaments last year at the after Christmas clearance sale a TM. I have been saving them for twelve months. I love the way the violins and french horns sparkle at night on the lighted wreath. Naturally horns play a huge part in the celebration of Christmas. I found this red horn at the same sale last year. "Hunting and Gathering" gives me such joy. Just a snippet of angels enjoying their home for awhile. Thank you for visiting My Cozy Corner to have a look at the Mantel of Music. I'm reflecting everyday on what a Joyous Life I live and I'm so happy when you visit and leave a comment. How about joining me as I partake in a few parties. I'm off to price my bazaar items and take some photos. Oh my goodness...what a beautiful Christmas sight. Your angel collection is to die for.Thanks for sharing with us. i have similar gold instrument ornaments! love em. Such a lovely mantel! I love your angels and all the instruments. Each angel is so beautiful! The angels are perfect with the beautiful instruments. It's a lovely mantle. Your mantle of music is lovely. What a nice collection of angels. I am just entering the world of grandparenting next spring. It sounds great the way you speak of having your granddaughter around. I'm so enjoying seeing all the beautifully decorated mantles in blogland this week, yours is absolutely stunning. Your collection of angels is wonderful and makes your home look so very festive, lovely mosaic.